And then I went right on chatting. My mom still laughs about this incident now, but in many ways it foreshadowed my later affinity for striking up random conversations in the most unexpected places. Some of my closest friends or most interesting memories today have emerged from chance encounters of the Love Actually sort: getting a ride with another grad student to a surprise banquet, sitting down at a conference table with a Disney Imagineer, chatting with the night shuttle officer on my way back from school, catching public transportation and whiling away the time with surprisingly fun conversation. Though I don’t consider myself particularly confident (blog name, anyone? ), I still love love love to meet random people. One of my best grad school friends is a bright, energetic gal I met in a Zumba class my first year: we spent the entire quarter beaming at each other in the mirror as we grooved and moved and body rolled with as much grace as flopping fish–and when we both arrived on the “last day of class” only to realize that the last day had been last week, we ended up jamming to our own tunes by setting up an improv class with her friends. Anytime anyone asks us how we met, we turn and positively grin at each other before launching into one of our favorite stories. Meeting strangers isn’t only an exciting way to make new friends–it’s good for you, too. Friends frequently ask me how I manage to stay so friendly and open to meeting new folks all. The. Time. Well, a) I am not friendly and positive and open all the time. Just this week I had a total meltdown at 1 AM and practically shook my parents with my not-too-generous hysteria over the phone for 90 minutes. (Thank you, Mom!) b) When I am friendly, though, and that’s most of the time–it pays off. And it’s addicting. This month alone, I’ve met three people while standing in lines for things and actually managed to stay in touch with them. And most of the time, if they’re willing to engage in a random conversation with you, chances are that they’re lots of fun to be around, too. Like any book-crazy kid, I distinctly remember reading this book about the Berenstain Bears and stranger danger. I’m not advocating dumb, reckless danger-seeking encounters with sketchy people–I’m talking about putting away your cell phone as you wait for the cashier to ring you up and asking them if they still have a long day ahead of them. 95% of the time that’s where the conversation ends, but trust me: for the tiny amount of effort it takes on your part, other people sure notice it a lot. Recently, a friend asked me where I get my endless stream of conversation starters from. How do I keep a conversation going organically? My answer was first, nervousness–I’m really not a “casual silence” kind of person, so if I sense the end of a conversation coming up, chances are I’ll already be thinking ahead to the next tangentially related thread. Second: questions. I once attended a keynote about the art of communication, and the speaker made a point that has resonated with me ever since. Do you ever notice how nervous we get when we get up to speak in public, but how comfortable we are listening? Well, the same goes with conversations. If you’re nervous, ask a question and make the other person do the talking. They’ll feel like you’re genuinely interested in their lives (and hopefully, you are), and you’ll feel much more at ease for having got the ball rolling. You may brush off your hands and congratulate yourself on a job well-done now! It takes some time to adjust, but as I’ve grown more comfortable reaching out to more and more strangers, I’ve found myself encountering an incredible new circle of acquaintances and–I’m proud to say–even friends. For 30 minutes every morning this month, I chatted with a bus driver named David, who turned out to be one of the most intelligent, gracious, and knowledgable people I have ever had the privilege of meeting. Forget my preconceptions about what bus drivers do–this man, who has an oldest daughter my age–even gave me some of the best advice for dealing with rambunctious neighbors that I have ever received. He transferred bus lines recently, but it’s still amazing to think that our paths still have every chance of crossing again in the future, and in the most unexpected circumstances. More recently, I got to know a guy on the airport shuttle and we got dinner while talking about our PhD programs, vegetarianism, and cooking. I befriended so many children’s literature conference folks that I probably wouldn’t have met had I mummed up and kept to myself during the breakfast lines. I met another vegan friend while waiting to get airbrush tattoos drawn at a festival. I met yet another acquaintance while lining up for cake at an event. And yes, I’ve kept in touch with all these people that I have met in the past 30 days: people who may end up flitting in and out of my life eventually, but are for the present moment at least such important, fun players in my daily excitement. You never know if the next person you meet may be your future employer, a great friend, a romantic interest, or just a plain pleasant person to chat with. 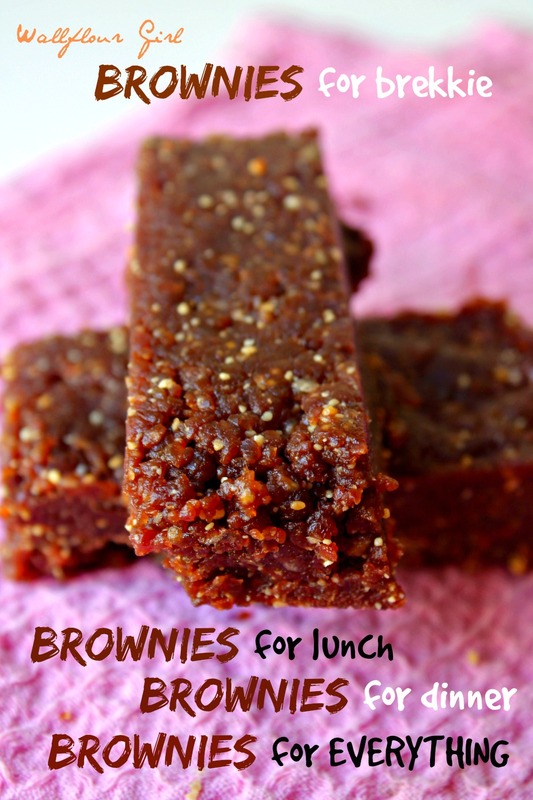 While I’ve singing all these preachy praises about de-dangering strangers, however, you’ve probably been wondering about these brownies–these wonderful, gorgeous, delectable little bites (or huge hunks) of raw brownie. Many folks I know think that “raw,” “vegan,” and “gluten-free” are crazy fad words accompanied by terrible food. If you haven’t met raw bars like these before though (and I’m betting you haven’t, though you may have seen similar versions like my recipes for this and this)–keep an open mind and try them out. They’re sweet but only naturally so–they satisfy all those processed-sugar cravings you’ve been getting and trying to deny–and they’re actually insanely delicious. They taste more like chocolatey larabars than brownies, but the raw chocolate frosting sends these bars over the top. In short, these are probably the best strangers you’ll ever meet in the food spectrum. Make them! And don’t forget–every person (and recipe) you pass could be the next connection you’ve been waiting to meet! This week, I challenge you to put aside your phone, book, distractions, whatever–and to meet one stranger. Try striking up conversation in the supermarket or ask them a question about the book they’re reading, and then report back here. What was your experience like? Was it a positive, negative, or neutral one? How did you feel afterwards? The perfect chocolate fix without any of the guilt--a refined sugar-free, no-bake, 3-minute recipe that my friends have been requesting left and right. Perfect for the vegans, chocolate-lovers, or general human beings in your left! Throw everything in the food processor and pulse until dough comes together. Pour dough into aluminum foil, smushing dough until it forms a rectangle about 2/3-inch thick. Pour or spread chocolate frosting (recipe below) evenly on top. Chill in fridge until ready to cut into bars. Blend dates in food processor until very smooth, about 2 minutes. Add coconut milk and cocoa powder; continue blending until completely smooth, to a thick liquid state. Pour evenly over brownies. Ah, the kindness of strangers. 😉 Silence can actually be good — in my case it means I’m digesting something that was said. But it doesn’t work that well unless you’re with people you know reasonably well — otherwise both parties get nervous about the silence. Wish there was a cure for that but there probably isn’t. Anyway, super recipe and post — thanks. Yes, I agree about getting used to comfortable silences! I’m getting better at it, though that’s less intuitive for me than chatting away. From what I’ve gathered, I think you’d be the perfect conversationist! Wow, this brownie looks super heavenly! Loving the sound of the hot fudge and the chocolate frosting- I definitely need to try the recipe out! I love this post so much, Ala. It sums you up perfectly – you are an incredibly energetic, positive and friendly person. Being around you, the joy is infectious. Sure, you have your tough times like the rest of us (some, like glass-half-empty me, have more than others!) but for the most part, you are truly a bright ray of sunshine. I like striking up conversations with people too. I’ll talk to people in line, in the elevator, on the bus. I definitely talk to cashiers, service staff and my local Starbucks barristas (who I see almost daily). Genuine connections and friendly conversation can change a person’s day, both for me and the person I’m speaking to. 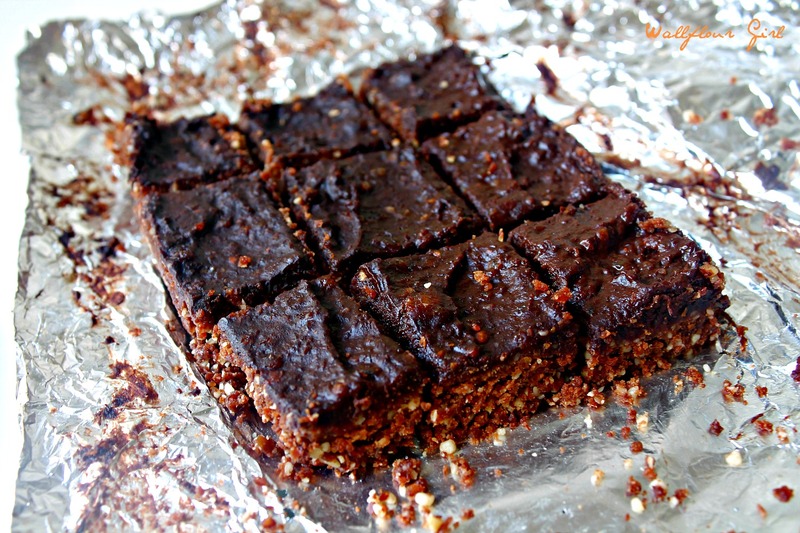 I definitely need to make these raw, vegan brownies. I have a giant bag of dates at home just begging to be made into healthy brownies! Wow, let my face melt off in a mixture of hot embarrassment and pleasure as I read your comments, yeah Nancy? That’s one of the shared traits I liked best when we met–I remember us both chiming in to say hello and talk to the waiter, which I think is one of the most fun parts about eating out. Points to us! Haha. And YES, turn those dates into brownies. I also have this KILLER salted date caramel bar I think you’ll love….arghhdhfkljad;fa so much good stuff! Thinking these exceptional raw, gluten-free Brownies could be tucked away for a “healthy” afternoon snack! A splendid recipe! Now this is the kind of raw, vegan food I could go for!!! YUM! Great tips on starting conversations…you are pretty darn savvy for a wallflower 🙂 Have a terrific weekend! Haha! Aw…I do try my best to get by. I’ve learned that some wallflowers can still be pretty colorful characters! I know you’d love this one, especially with all your excellent skinny tips and recipes. Cheers, Liz! I’m really shy when it comes to striking up a conversation with strangers. I don’t think I’ve actually started one in forever. I do end up talking to people when they get sick of the awkward silence lol! But I will try your challenge and try to talk to a stranger this week as I am out. Ah I’m completely the opposite of you… I’m super fearful of conversations with strangers. My best friend is a talker – we actually met when we were 12 and she chatted me up while we were in the lunch line at music camp. The whole time I was like, omg this crazy girl just won’t shut up and leave me alone!! But obviously she eventually wore me down since we are best friends now haha. The brownies look great, although question – how much can you taste the dates in these? I hate dates, but these just look so tasty and good for you!! Loved reading this post and your tips Ala! I used to be super shy and would always try to avoid conversations with strangers but now that I am older I have opened up a little bit more and there are days I even find myself rambling on too much haha. These brownies look fantastic! I love using dates and the coconut milk in the frosting sounds awesome! Hehe, I was always a chatty kid (getting reprimanded in grade school for talking too much) but I totally feel you–I can be pretty wary of conversations in some awkward instances as well. And I’m glad you like the brownies–duuude they are so amazing, Kelly, I can’t even begin to describe their awesomeness (although I’ve clearly tried). Have an awesome rest of your week!